With the blue potatoes I picked up at st.Jacob's farmer's market (check it out if you want a yummy apple fritter recipe!) last week I went ahead and made this salad to highlight their beautiful colour. 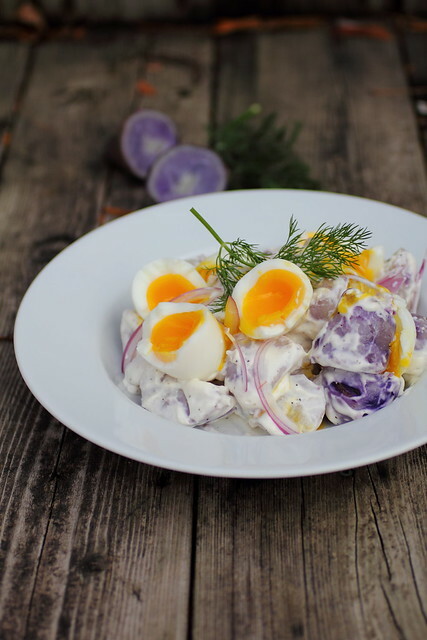 Day ahead prep potatoes: I find any potato salad will have better taste if the potatoes are brined but feel free to leave this step out if you wish and go ahead and season the dressing with some acid to bring out the flavours. 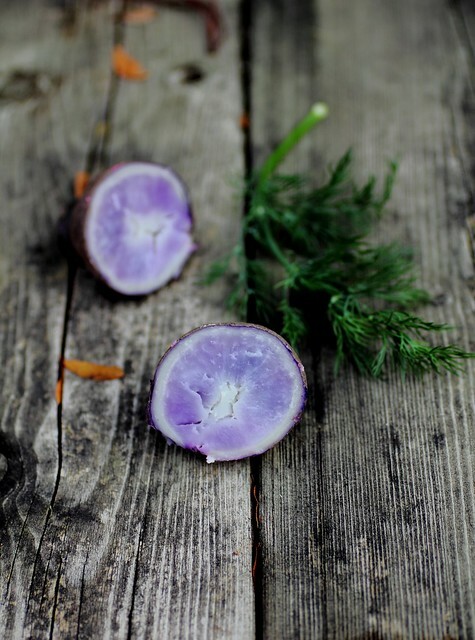 - Boiled Blue potatoes (or use whatever potato you have on hand) - wash and boil with peel in salted water until knife tender. Remove skins if they're tough and chop into quarters or bite size pieces. For more flavour follow brining instructions here and set in fridge overnight. You can omit some of the sugar in the recipe as it can be a bit too much. Basically boil some water, sugar and vinegar and then pour over the potatoes (the amount you make depends on how much salad you're making and how many potatoes you use. I used 7 small potatoes here and it yielded the one plate in the photo. 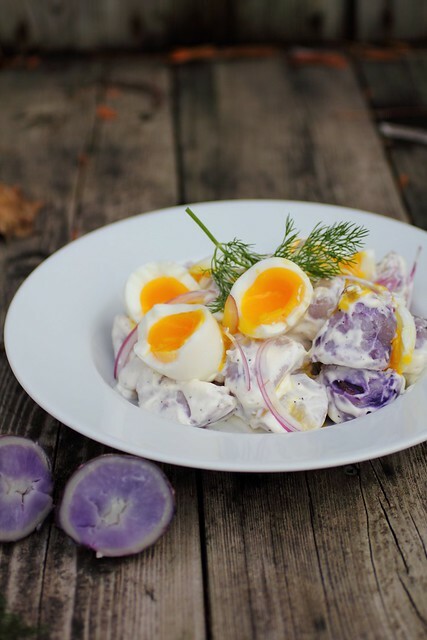 Dressing: The egg yolks contribute to the dressing so what we're looking for here is a light dressing that lightly coats the potatoes to preserve their colour. For soft boiled boil a saucepan of water lower heat to gentle simmer (medium high) Lower eggs in and set timer to 6 minutes. 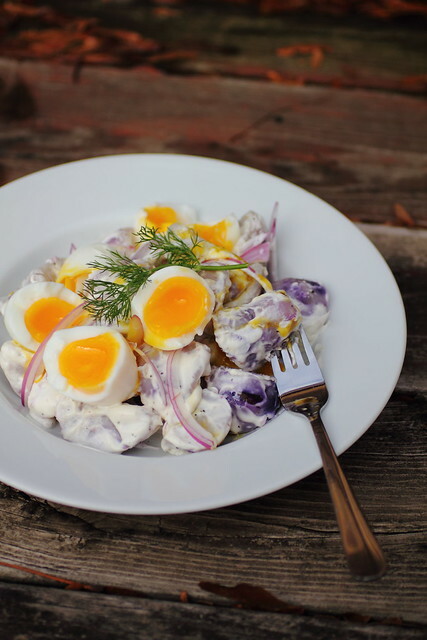 Break the eggs in half using your hand or a knife and set in the salad gently, toss gently. If you want it to look pretty leave 1 or 2 eggs and lay them on the top for garnish. Sprinkle or garnish with chopped dill. Looks delicious! 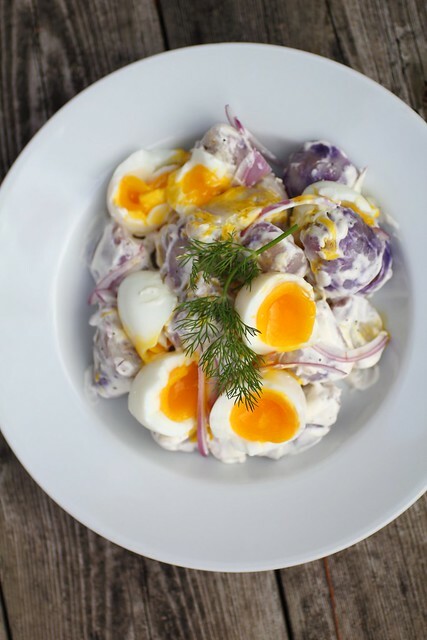 So much prettier than your run of the mill potato salad! 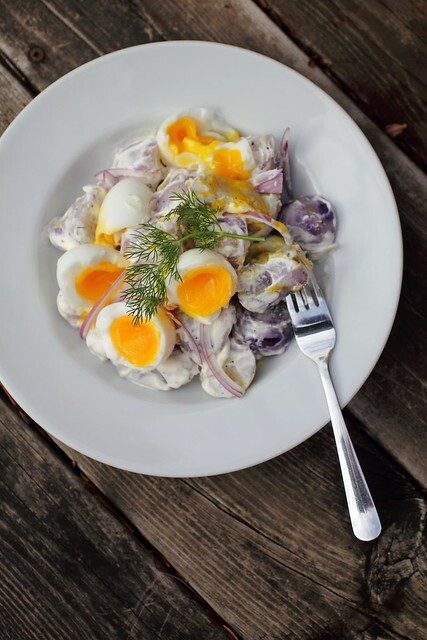 After seeing this awesome recipe, I was researching why blue potatoes were healthier potatoes, and I came across a movie called Blue Potato! http://bluepotatomovie.com/ I am going to make this recipe while I watch the movie, ha! Thanks! Jim, how cool is that?!! Thank you for sharing, I will check out this movie too. Remember if you're going to follow the recipe eggs and all you need to serve it immediately when the eggs are warm, that's about the only tricky part, everything else can be made in advance. Hope you enjoy it, and Thank you for the info about the potatoes, I did not know that they are healthier!